The social web is increasing tremendously from last year or so and there is no constraint of any language. Social web is multilingual, according to a study in February 2010, nearly half the tweets in Twitter are in other language than English. Facebook has also seen such large number, they had already translated Facebook into more than 50 languages all over the world. And if you are also a Twitter or Facebook user, it is quite possible that you get tweets from your followers or news feeds/comments on Facebook from your friends other than in English language. It happens with me also because I have friends from all over the world and they sometimes update in their native language. It is difficult for me to understand and I use different translation machine to translate updates other than in English language. But now I use a Google Chrome extension called Social Translate that easily translate tweets, news feeds and comments on a fly. Social Translate is a new open source extension for Google’s Chrome browser that translates updates on social networking sites into your native language using Google Translate. A user selects a primary language in the Options settings panel. Then when the user visits a social network site such as Facebook or Twitter, the Social Translate extension will use Google Translate to detect the language of the event stream (or comments) and then translate the text to the user’s primary language. 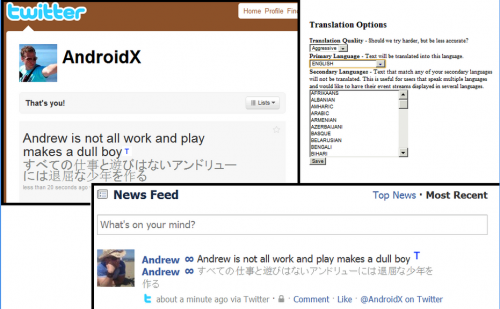 The extension displays the Social Translate icon beside the translated text. Click the icon that appears in the navigation bar to see the text in the original language. Event streams or comments in the primary language should not be translated. A user can also set multiple secondary languages in the Options settings. Event streams or comments in these languages will also not be translated. This is useful for users that read multiple languages and who would like to be able to see non-translated content that is posted in other languages. Though, it is in early stages, so you can find some bugs. For me. it detects languages exceptionally well on Twitter but on Facebook, it is less useful. It only translates status updates and comments as they appear in your News feeds. I hope they will update the extension in which it can translate profiles or other user’s wall. Social Translate is surely a time saving extension when it comes to translate languages in social networking sites because it automatically translate into your native language. And according to developers of Social translate, they are working on updating the extension which will also work on Myspace and Google Buzz.